Assassin’s Creed Odyssey takes place in a gorgeous game world that seems to expand in all directions, and it’s an experience that will continue to grow after it launches. This trailer, produced for Ubisoft, is an exploration of it’s post-launch content. In it, we’ve tried to balance the epic variety and ambition of this game world, with an informative and easy-to-understand flow that outlines all the content to come. Playing a horror game in public is sure to garner more than a few strange looks, and in our trailer for the Nintendo Switch release of Outlast, that was just the twist we needed. This trailer piece even made the front page of reddit! ████████, █████████. █████████████████, █████████ █████, ██████████████████, ███. Sometimes, you've got to go over the top, and then try and top that. Square Enix asked us to a create a sugar rush of action and destruction for their reveal for Just Cause 4, which was unveiled at Micrsoft's 2018 E3 conference. This entire trailer was captured in-game with no scripting, and is a great example of our ability to mix our technical and cinematic chops. The bigger the villain, the bigger the hero, and in our trailer for Just Cause 4’s main antagonist, we explore a little bit of what makes Gabriela Morales, the Commander of the Black Hand, tick. In classic Just Cause fashion, things get a bit wild along the way. In Assassin's Creed Origins : The Hidden Ones, Bayek and The Hidden Ones will face their biggest challenge yet. Amidst a world of conquerers and vicious power struggles, they must lay down the foundation for what will become the Assassin's Creed. Ubisoft recruited us to depict this struggle in a high-stakes cinematic trailer. In a wild world, it's good to have a friend riding shotgun. We produced this co-op trailer for Ubisoft's Far Cry 5, which relishes in adventure and mayhem as two best buds explore the vast world of Hope County. The crew at Altar provided both creative and production chops to develop this little ditty, from humble road-trip script to explosive gameplay trailer. This barnburner Reveal Trailer, which we produced for Ubisoft's dramatic world premiere of Far Cry 5, presents a vision of small town Americana that has been twisted by a strange and manipulative homegrown cult - And the people that will fight back against them. We worked in close collaboration with Ubisoft to develop an identity that balanced heady subject matter and the bombastic, all-out fun at the core of all Far Cry games. This ambitious trailer production integrated Ubisoft's own development tools into our creative process, which allowed us to offer uncompromising flexibility and creative possibilities to our client as we explored the deepest depths of Far Cry 5's stunning game world. Ah, nostalgia. 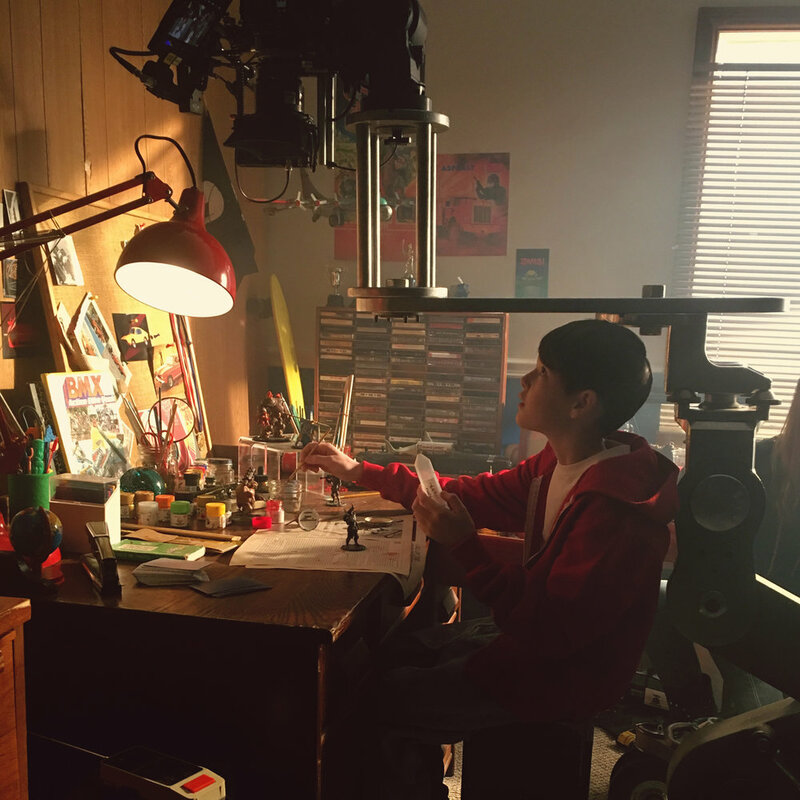 This ad, produced for Ubisoft's Might & Magic Showdown explores the childhood passions that we've all let fall to the wayside. Thankfully, video games are here to remedy the situation. We wrote, directed and produced this ad, which involved building the childhood bedroom of our dreams and shooting on-location in the adult apartment of our dreams. Keen eyes will spot a photogenic lizard among the various easter eggs - Yes, he's real. We edited this music video short for Le Matos' song "No Tomorrow", which is off their soundtrack to the recent cult hit Turbo Kid. Directed by our friends RKSS and set in the universe of Turbo Kid, the video includes frisbee, feeding spaghetti to a dead guy, and a confrontation with a post-apocalyptic cult. NICE. We created this Story Trailer for Watch Dogs 2, which one part crazy-romp-through-kinetic-game-world, and one part introduction-to-new-characters-and-story-threads. Distilling hours worth of story into a bite-sized format is one of the great fun challenges of our work, and this is no exception. This multiplayer trailer for Ubisoft's first VR title, Eagle Flight, is our leap into marketing VR games. We directed and produced this ad - including gameplay capture, which was shot from within the confines of VR headsets. A great experience, but a slightly antisocial one. When Ubisoft asked us to create a campaign of behind-the-scenes videos for Far Cry Primal, we saw an opportunity to bend the typical developer diary formula. It involved hauling a busload of game developers away from the comfort of their cushy studio and back into nature. Then, we got them to ruminate on their game and how life was like for their primal ancestors. It turned out to be a great idea - Not only did we get some great insights for our campaign, but without the distractions of game studio hustle and bustle, the devs were able to make some important production decisions over lunch. Bonus. We went into the Beastmaster trailer for Far Cry Primal with one mission: Make the game's beasts feel like the ultimate weapon. This trailer is built of a combination of in-game capture and custom cinematic cameras. Because Primal is a first-person shooter, its hero, Takkar, is rarely seen on camera. To solve this, we leveraged our knowledge of production tools to render him into many scenes of the trailer, which builds a narrative around his quest to tame the predators of Oros. We wrote, directed and produced this trailer, and got the chance to choose Chelsea Wolfe's amazingly brutal track Carrion Flowers as a fitting soundtrack to Primal's savage and beastly world. Created with the support of TV5, this web series tells the story of David (Emmanuel Bilodeau), a passenger of a deep space voyage, who awakes from cryo-sleep to find himself drifting in the empty vastness surrounding Jupiter. From the confines of his life support pod, David must find out what has gone wrong and how to return to his family aboard their passenger ship. We created and produced this year-long, 6 episode campaign for UBISOFT'S Rainbow 6 Siege in close collaboration with its development team. It was a great opportunity to explore the depth and layers of Siege's tactical gameplay. This is legitimately one of the coolest projects we've ever worked on. We handled the concept and vision creation, scriptwriting, as well as developed pre-production storyboards and art direction. The end result speaks for itself and remains one of the best game trailers we've ever seen. The vision for AC Black Flag's Horizon Trailer came from the sensation of being on open water. Working with an unconventional double-widescreen format supported this open sensation and allowed great opportunity for visual exploration. The soundtrack, Half Moon Run's Full Circle, paired great with Black Flag's restless pirate spirit. AC : Black Flag's gameplay deep dive was created as a merger of gameplay demo and narrative exploration of the world, streamlined into a clean, informative and long-form video. This trailer is a good example of letting a game world speak for itself. Creating an Assassin's Creed trailer without a single kill was a fun challenge we set ourselves, which left room to explore the beauty of the game's world. We were responsible for developing the creative vision of this trailer, finding the right soundtrack to support it, and offering creative consulting throughout the production. On Unity's production team, we also directed the game's dense and detailed crowd life system, which involved recreating Paris' revolutionary-era way of life in the game's open world. We provided the direction and writing of all crowd activity, which involved over a month of motion capture to produce. Directed in-game cutscenes and scripted events for Eidos' stellar follow-up to the classic Deus Ex franchise, including motion capture, camera integration and scripting. Created concept, developed script & storyboards. Full trailer production - including concept, direction, capture and editing.